Every year you pay a hell of a lot of tax. If you had to pay the government your annual contribution up front each year, you would pay ALL of your income for January to the government. And all of your income for February. And all of your income for March. And some of your income for April. An American on average wages would finished paying their 2005 tax bill on April 17 this year. Unfortunately, I have the misfortune of living in high-tax Britain. Here the average person has to work another month and a half for the government. THAT'S ALMOST FIVE MONTHS OF BEING THE GOVERNMENT'S SLAVE, EVERY YEAR. Frankly, if the government stopped running up huge debts, Tax Freedom Day would be even later: June 7! If you add in the costs of going to work for those five months, and other work-related expenses, it becomes clear that half the life of us Brits is spent working for the government. Over a working life, that's 20 years of going to work, not for yourself, but for the government. So next time you hear about the wonderfully generous plans of your government and of opposition politicians, just remember who'll be picking up the tab. And if you're living in America, appreciate the extra month and a half of salary you'll get to keep in comparison to us Brits. Does anyone have a spare Green Card? ... and Michael Howard. Ho, hum." 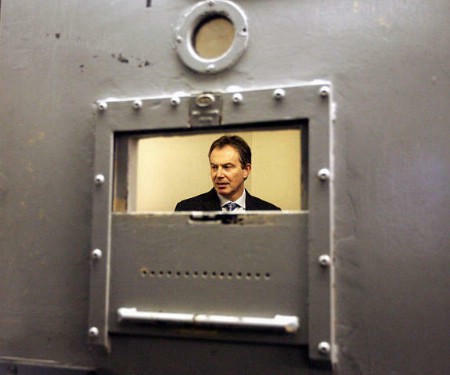 If you believe criminals should be let out of jail, after serving just half their sentences, vote Labour. If you believe that your civil liberties should be sacrificed to fight secret 'Terrorist' threats that wouldn't stand up in court, on the word of politicians who've been caught exaggerating Terrorist threats, vote Labour. If you believe the government should be able to spy on your emails, web surfing, text messaging and instant messaging, because it feels like it, without having to justify that intrusion to a judge, vote Labour. If you believe that one in six people are incapable of passing a single GCSE, after 11 years of schooling that cost £50,000 each, and that state education provision isn't failing those pupils badly, vote Labour. If you believe that the NHS's problem is a lack of funds, even though hybrid health-care systems in Europe with similar levels of funding per patient have materially better clinical outcomes, fewer deaths and less waiting, vote Labour. If you believe the Government was right not to fire one of their advisers who said that September 11th was "a good day to bury bad news", vote Labour. If you believe that university standards must be lowered in order to hide the abject failure of government-run schools, vote Labour. If you believe that increased taxes on pensions encourage people to save for their retirement, vote Labour. If you believe that people who save nothing should be financially rewarded, and that those who do save should be financially penalized, vote Labour. If you believe it doesn't matter whether a Prime Minister deceives his cabinet, parliament, the armed forces, and the people of his country, in order to take his country to war, vote Labour. If you're glad your council tax has risen, your national insurance contributions have risen, that your pension fund has been raided, that your council tax is set to increase still further, and that your national insurance payments are set to rise, vote Labour. If you believe that some parents should be forced to send their children to failing schools, and that they should not be allowed to send their kids to better schools that cost the same amount, vote Labour. If you believe that troublemakers must not be excluded from school, even if they continually disrupt the education of everyone else, vote Labour. If you believe that external independent assessment at GCSE level should be largely replaced by teachers assessing their own pupils, vote Labour. If you believe the people are too stupid to elect the House of Lords, and that a 'reformed' House of Lords must have unelected appointees to make our laws, vote Labour. If you believe that the police should spend most of their time filling in paperwork, and gathering statistics for the government, vote Labour. If you believe that Fundamentalist Christians and Fundamentalist Muslims should be encouraged to take control of hundreds of schools, and that the taxpayer should foot the bill for the indoctrination of their pupils, vote Labour. If you believe the government should be able to lock you up indefinitely, without trial, without access to the evidence against you, or even details of the charges of which you are accused, vote Labour. 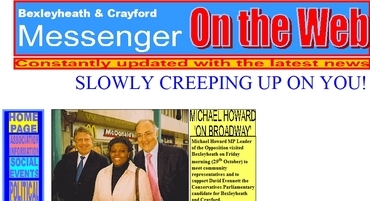 Michael Howard's Slowly Creeping Up On You! I've met Michael Howard. Not only that, but I once had a birthday party at the McDonald's pictured behind him. That was back when Conservatives won elections, Starbucks had yet to colonize London, and the fountain within sight of Bexleyheath MacDonalds had yet to be built, let alone filled with bubble-bath by troublesome youths. When you search for stuff on Google, where do the descriptions on the results page come from? 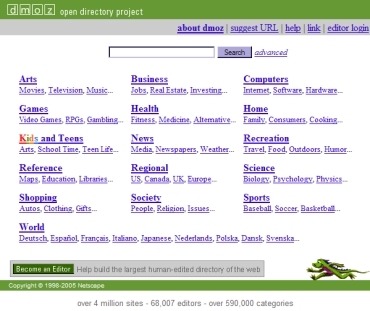 In many cases, they come from a web directory called DMOZ - The Open Directory Project. DMOZ lists over 4 million web sites. Each site has been reviewed by one of 65,000 volunteers. The results of this industrial-scale voluntary project are used by Google, Altavista , AOL UK and Excite UK. Oh god, not another web site with a chairman's message, a list of association officers, local propaganda, councilor contact details and an out of date events calendar. But once in a while I come across a site that reminds me why I volunteer my time. This week, I added the Conservative sites for Bexleyheath and Crayford (I lived in this constituency for 13 years), Bromley and Chislehurst (I live in that constituency now), Greenwich (I walk through it on my way to work every day), Dulwich and West Norwood (canvassed there), Edmonton (ditto), Eltham(ditto, plus used to pass through it on my journey to school for years), Hammersmith and Fulham (canvassed) and Lewisham West (canvassed). That really brought home that whilst I may edit in an American-run project, stuff stored on an American server, the consequences can be very real, and very local. Elections are a serious business. That's why the Conservative party is giving you a chance to become a slapper. In their latest online game, they've even gone to the trouble of giving John Prescott boxing gloves. How thoughtful. Should You Be Allowed To Vote? Are you a smart voter who is clued-up on what's really happening in Britain, or will you be voting in ignorance, deciding based on false assumptions? Take the MySociety 2005 General Election Estimation Quiz to find out. Interestingly, the author of the quiz posts details of how clued up the supporters of the three main parties are.